What are the trends that will define the year to come? ValueInsured Founder and CEO Joe Melendez sets his sights on the shape of the 2018 housing and mortgage market. How Could Blockchain Reshape the Industry? 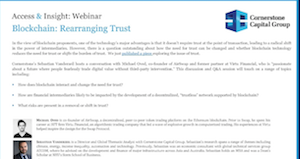 An informative webinar explores the nature of how blockchain shifts the burden of trust, and some of the ways it could revolutionize business interactions. The quarterly survey of independent title agents and other real estate professionals reports that optimism is up as respondents expressed confidence that transaction volume will grow in the coming year. 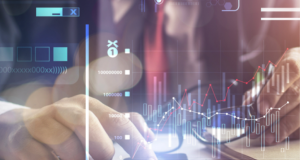 Black Knight's new robotics capabilities can help lenders improve operational efficiencies and loan cycle times, as well as reduce loan origination costs. Big Banks and FinTech: Do American Consumers Want Both? The U.S. Senate Committee on Banking, Housing, and Urban Affairs held a hearing entitled “Evaluating the Fintech Landscape” Tuesday where witnesses examined one of the fastest growing industries in the U.S.
Tuesday, the Committee on Banking, Housing, and Urban Affairs will meet in an open session for a hearing titled “Examining the Fintech Landscape.” See the details as well as what else is coming in The Week Ahead.